Ninja Ultimate is a side-scrolling beat-em-up game where you control a ninja battling other ninjas with swords and magical powers. The App Store description describes this as Stealthy ninja action mixed with RPG elements. The first part is straight up not true, but it does have RPG leveling elements!! Ninja Ultimate is brought to us by Morning Egg Inc. on the iPhone, iPod touch, and iPad for $0.99. I’ve never hid my opinion on how other people review games. I don’t have any clue what type of quality of games they expect on the iPhone, but I’ll just say this. I believe that games all should be placed on a higher level of quality and expectations. “The graphics are attractive, the game controls smooth, and the gameplay interesting.” “The controls run smoothly, and the games pace is spot on.” I don’t know if I can agree with any part of that. First, the good part is that this game does in fact have interesting gameplay in it, the idea and concept, while overused, is still interesting thanks to the many different ways someone can interpret ninjas. However, I was pretty frustrated with this game and that was disappointing. The graphics are never consistent. Levels are blurry and they do not match the characters at all. The characters have compression artifacts with a blurry pixelated edge. The controls are stiff and unresponsive. Firstly, when you attack, you can’t move and the sword swing is delayed. 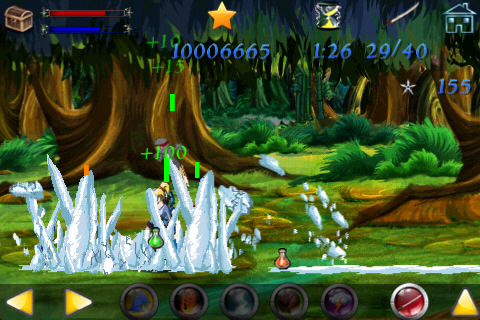 You will get caught in the attack animation while enemies smack you from behind constantly. It’s clumsy at best and can be fixed by making attacks instant while retaining the ability to move or at least not be locked down in the animation. Ok, I’ll admit, the gameplay is actually interesting… about 10 stages in. You level up weapons, skills, and your stats, battle against ninjas of varying art styles that don’t match at all, and you move through levels for more stars. Killing ninjas can be interesting when you get more powers, but in the early levels, the only skills you’ll have are jump and attack. It’s boring until you finally get enough experience to train to level 1 or you waste your exp to buy some skills. This is what is known as bad pacing. You pace the game so something new is introduced after you are adjusted to a previous new item or skill. It keeps things interesting and motivates you to hit the next benchmark without giving your player too many options from out of nowhere. Here, it takes a ton of kills of these annoying little ninjas just to level up to level 1. Magic and skills cost way too much and you don’t get much experience per enemy so most of the time, it’s a grind. Most skills are very and wasting 10000 exp for a wind attack that only knocks down enemies temporarily is a huge disappointment since the controls are so stiff, moving to an enemy and attacking them becomes a challenge all by itself. There aren’t boss battles to break up a level and the repetitive nature of the game is doubled by the repetitive, constantly repeating music. They have different songs for different levels, but all of them are these short 30-60 second sound bites that repeat endlessly. If you have to patience to stomp through the swamp of boring for about 5 or 6 stages, after you level up some or get upgraded powers, the game’s controls and repetitive music starts to be less annoying, mostly because you finally get something new to play with. Until then, it’s the same thing over and over and the enemies quickly become the mosquito sucking your brain. Annoying and numbing. AppSafari review of Ninja Ultimate was written by Joseph Ho on November 10th, 2010 and categorized under App Store, Beat-em Up, Games, RPG. Page viewed 3393 times, 1 so far today. Need help on using these apps? Please read the Help Page.